Irish soda bread consist of real simple ingredients and only have baking soda as the raising agent. It is very filling and is a must amongst the Irish. This goes really well with an Irish Lamb Stew. Irish lamb stew needs to have Irish beer in it to be called an Irish but some people usually just substituted the Irish beer with chicken broth because it taste weird for many. This recipe was given to me by a friend (Nope, he's not Irish!) and is so dead simple that anyone can do it. No eggs required in this recipe. Simple, easy and fast! No yeast, no need to wait for a long time before baking. Just baking soda as raising agent! I am so impressed with how easy this recipe is. Some people do add in sultanas in the dough but I'm gonna serve this with a savoury stew so I did not put in any If you like them, put them in. These are good eaten plain with butter and maple syrup too! Start off by preheating oven to 190°C and line a baking tray with baking paper. Lightly grease the baking paper and set aside for later use. Sift the first two dry ingredients and add in combined salt and sugar in a mixing bowl. Rub in the butter or pulse a couple of times in your processor until each and every butter bits are as big as the size of a pea or smaller. The * components forms buttermilk. I do not have any in hand hence the substitution. Use the real buttermilk if you can get hold of it. Pour in the buttermilk to form a dough. It is very sticky so it's okay, you are on the right track. Invert out on a floured surface and form 2 equivalent size balls. Try to use as little flour as possible. Place both ball of dough on the tray and use a sharp razor to cut an 'X' on the top. You can do a egg wash glaze and brush it on top of the dough at this stage. I was lazy and decided to go rustic-style. I dusted some plain flour on it and pop it into the oven to bake for 35-45 minutes. This is a real good, sumptuous meal for St. Patrick Day. This is very refreshing! Your watermelon has gotta be really sweet for this and you can keep the rest of the watermelon rind for this watermelon sweet drink. I made this when I was trying to clear leftovers again! This makes very little, like about 4 champagne glasses or so. I like the fact that it is so versatile, you can use honeydew and rockmelon definitely! Dissolve the sugar in hot water and mix in the ice cream to melt. Add in evaporated milk, cooked sago and the watermelon juice. Stir to combine well and ladle into four tall champagne glasses. Optional: Float 4 watermelon balls on each glass and serve straight. Look at the kitchen mess...... Aaron had a good time cleaning it! Thanks baby! This is another self-invented tiramisu. I called it the old-fashioned tiramisu because this is one plain tiramisu, infused with nothing but Marsala and Kahlua. No lavender, no durian, just pure plain unadulterated creamy, luscious mascarpone cheese. Buy the best creamy one you can get off shelves, don't substitute with cream cheese please, it's just different. There is no one right recipe for tiramisu. I have Italians coming to me telling me original tiramisu shouldn't have alcohol in them, some say there should be. Some stuck-up 'experts' say there should be no raw eggs and there shouldn't be chocolate shavings used nor cocoa powder dusted in between layers. Lemme be honest with you freaks, it is my own tiramisu and the only reason I homemade it and not buy it off a bakery is the fact that I love the freedom of having control of what goes in there. I like that this recipe that I could gladly call my own is rich, creamy, yield a small cake and is not your typical tiramisu that you can get any day from a bakery shop. I've been generous with the splashes of Marsala and this tiramisu has a hint of homemade specialty that you can't get anywhere unless you make one yourself. Zabaglione (pronounced as tsah-bahl-YOH-Nay), or some call it Sabayon is a dessert by itself. It usually contain egg yolks, sugar and sweet wine, usually Marsala Bain-Marie-d together until thick and creamy. In our case, we'll make the Zabaglione and incorporate that into our luscious Mascarpone filling. Start off by making the Zabaglione. Combine the egg yolks and castor sugar in a medium bowl and use a hand whisk and whisk them until all sugar dissolve and the mixture turned pale, thick and increased in volume. Place that over a pot of simmering (not boiling) water, making sure that the bottom of your medium bowl is not touching the water surface. Whisk, while slowly adding in the Marsala wine to mix properly. This take a good 5 to 10mins, have faith and be patient. Don't be tempted to do it over high heat and shorten the whole process, you'll ruin it, trust me. The mixture will thicken over time. When it is thick enough that when you plunge a spoon in there and scoop out some cream, it is able to stand by itself on the peak of the spoon, defying gravity; you know you are done. Set t aside to cool down completely and whisk occasionally. I find that an icy water bath here works extremely well and useful. Now, with the aid of a hand held mixer, whisk the double cream until very soft peak form. Do not whisk pass this. Stiff peak will give you a hard folding in time later. Place the Mascarpone cheese in a large mixing bowl and give it a good stir to loosen it up and to ensure that it is a smooth, lump-free mass. Alternatively fold in the chilled Zabaglione and whipped double cream into the Mascarpone mixture. Once a uniform batter is achieved, chill it in the fridge while you work on the base. Dissolve the tablespoon of sugar in the hot Espresso and cool it down. I use water bath here again. Make sure it is really cooled completely. Now, combine that with the tablespoon of Kahlua and Marsala wine. Stir to combine well. Here's what I do, I'm a little different so you can choose to be or not be like me. Divide the soaking mixture (i.e. the espresso mixture) in 2 equal parts. Get ready an adjustable/7'' round cake ring placed on a serving platter. Arrange 6 large Savoiardi fingers neatly inside, close to each other. It is indeed very stiff and you might not be able to break and bend them but it's okay. Now, pour one part of the soaking mixture over it and let it soak up everything. As it absorbs the liquid, it'll breakdown and soften. Now use fingers and compress and break the sponge fingers to fill up each and every crevices and corners so the biscuit totally form a layer as a base for the tiramisu. Next, spoon half of the Mascarpone mixture over and smooth out the surface with a spatula. Optional : Give it a good dusting of good quality cocoa powder. Now, arrange the remaining 6 Savoiardi on a plate and pour the last part of the soaking liquid over. Once you see no liquids remain unabsorbed, quickly place the very soft fingers over the cream filling, forming another layer. Again, make sure there are not uncovered gaps and corners. Fill them all up. Finally, spread on the last layer of Mascarpone filling. Smooth it out and chill it overnight in the refrigerator. Upon serving, gently remove the cake ring and liberally dust the surface with cocoa again. Serve as chilled as possible. p/s: This makes one very wet tiramisu. The sponge layers are wet and very soaked, the way I like it. It might not look neat when presenting but tasty desserts are always ugly! Remember this, if it doesn't taste good, then it's probably not worth the calories! This one, if you miss it, you a huge part of life. I made this for this year's Chinese New Year, on the 8th day of the Lunar Calendar. We have grand prayers on this particular day and lots of guests are invited. This makes a lot and I'm not sure if you can keep it for long. Mine was finished in a day you see. I do not have a recipe for this and there are tonnes of chendol agar-agar floating around the internet. I've been risky and took one recipe from a Vietnamese website, which doesn't even come with a picture! Hey, I always thought chendol agar-agar is a very Malaysian/Singaporean thingy. Anyway, the website is here and I'm gonna retype them anyway even though I did not make any substitutes whatsoever. And if you are wondering how they taste like, they tasted really awesome. I would cut down the sugar a littl and use less coconut milk maybe? Not less coconut milk, maybe just use 1 coconut for all the coconut milk needed in both layers. I think this is too coconuty and creamy, and definitely high, very high in cholestrol! Stir and cook the first five ingredients above in a pot until boiling. Give the cornstarch-milk mixture a good stir and pour it into the pot. Bring to boil again and pour all the mixture into a 10'' round tin (Make sure the tin is thoroughly wet before pouring in!). Do not touch and shake it. Let it set and cool down whilst you proceed to make the other layer. Stir and cook the first five ingredients above in a pot until boiling. Give the cornstarch-milk mixture a good stir and pour it into the pot. Bring to boil again and add in all the chendol. Remove from heat and keep stirring until half set. Now, use a finger and gently press on the Gula Melaka layer. It should be 3/4 set now and firm to touch. Working quickly, take a fork and scrap all over the surface of the layer and pour the chendol coconut mixture over it. Do not touch and shake it. Let it set and cool down before chilling it in the fridge. Best served when really well chilled. This cake is actually introduced to me by Aaron. He said his mom made this once and he fell in love with it. Many people call this honeycomb cake or the Malays call this 'Bolu Sarang Semut' but when Aaron first introduced me to this cake, he known this to me as Beehive cake so Beehive cake it is then. 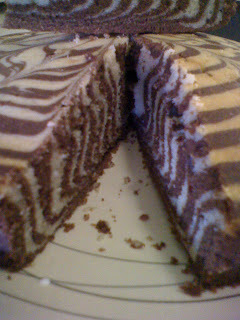 I have used the recipe from the book Fancy Cakes and Jellies by Vickie Chieng which turned out quite good in my opnion. You always hear people say they only got 75% of the beehive and must use bottom heat only and yada yada. I got like almost 100% (except for the skin on top which didn't form). 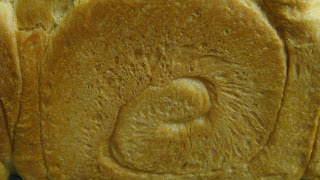 The picture above is the cross section of the inside of the cake and below is a slice of the cake itself. I've only removed the skin layer on top and that's it. Take a closer look at the picture below and notice the slice of beehive cake behind. That's the skin I am talking about. I think I sort of overbaked this a little so I remove the skin since it tasted a little bitter. I don't know whether the cake formed all beehive pattern by accident. See, I made the batter and all and the oven was preheated long time back and a phone call came. I couldn't bake it no matter what. So I switched off the oven and pop the cake into the fridge. Until the next night when I open my fridge to cook dinner, I remember the unbaked cake. I then quickly preheated my oven and cross my fingers, pop the cake in the oven and voila!!! Surprise, surprise. Result was better than I've thought. Start off by greasing and lining an 8” x 4” oblong cake tin. Preheat oven to 200°C. Beat condensed milk and butter till pale and fluffy. Gently fold in sifted dry ingredients. In another mixing bowl, beat eggs till fluffy and almost double in volume. Add into the condensed milk batter. Do the caramel now. Caramelize the castor sugar in a thick-based pot till it dissolves. Add in hot water and stir till it forms a syrup. Stir to combine well. Turn off heat. 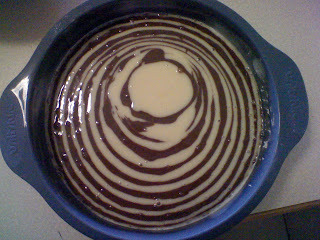 Fold the caramel into the mixed batter but do not overfold or air bubbles will be deflated. (I sorta cooled it a little before pouring because I'm afraid the heat from the caramel might cook the eggs in the batter). Pour cake batter into prepared tin and bake for 40 minutes. Check if cake is done with a toothpick. P/S: This recipe is called a cake but it taste very much like kuih like, chewy and very fragrant. I strongly suggest you don't reduce the sugar. This kuih is not sweet at all. All the best in getting 100% beehive pattern! 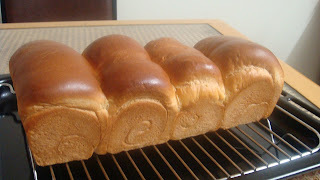 I hope it is not too late of me to post this Hokkaido Milky Loaf that has been circulating on almost every other Singaporean if not other bakers' blogs. I got the recipe here by Angie. 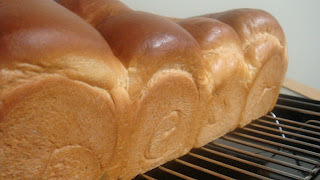 This recipe, unlike other Hokkaido Milky Loaf that uses Hokkaido Milk instead uses whipping cream. I think the whipping cream itself helps in producing a very very soft, fluffy, almost like eating cloud bread. As you could see from my picture, I didn't do a good job in rolling the bread dough up swiss roll style. I did weigh them just don't know where went wrong. I like my bread pan. I hardly grease it and yet nothing got stuck. And yes, I will make this again and again. p/s: I brushed the top of my loaf of bread with milk only hence no glossy finish. Made these panna cottas as dessert after a heavy meal. I'm afraid it might be too filling for some so I serve them in small quantity. Made these when I was the host so I really couldn't be bothered to sit them in hot water and turn them out and all. I made them the night before. Upon serving, I pour on the chocolate fudge sauce and place on some chocolate shavings. Give them one final dust of cocoa powder for the elegant look and serve them straight in the wine glass. Pour some milk from the 1 cup of milk onto the gelatine and let it stand for 10mins. While that is set aside, combine in a small nonstick milk pot, the remaining milk, cream, vanilla paste and the sugar. Bring to a gentle simmer. Turn off heat when it was about to boil. If you don't have a kitchen thermometer, you'll know when you see lots of steam escaping from the surface of the mixture. Add in the milk-gelatine mixture and stir until all dissolved. Return it back to the stove for a minute or two if you think it's necessary. Use your own judgmenet, we can be really flexible here. You're done and strain that into a spouted glass jug. Pour them into 6 tall wine glasses carefully without touching the sides of glass. I've been very particular and have gone to the extend to use a little funnel! Let them set in the fridge overnight or at least more than 4 hours. Combine all in a small bowl and bain marie until it form a uniform mixture. I stir it to cool it a while and pour 1 tbsp into each glass. Dust with good quality cooca powder. Use a vegetable peeler and run it through the sides of a chocolate bar and place some on each glass. Serve straight and you're all ready to impress! This is one cake that I always get wow with. The wow factor lies in the layering. 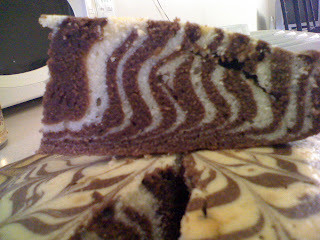 Just call it a marble cake if you fail in achieving the zebra stripes. I have on many occasions successfully replace the whole eggs used in this recipe with equal amount of egg whites and they look even better. Very white and very black, even more like zebra stripes. There was this peak period when ice-cream making was an everyday task hence all the accumulated egg whites! I baked this on an occasion to farewell myself in my part time workplace. That was last year before flying to Adelaide. My colleagues, especially Andrew loves it! This is not too sweet and they remain moist for a couple of days. The high oil and liquid (which is milk here) keeps it moist. I suppose one can substitute the oil with butter to get a more fragrant cake. I've not tried it yet though. 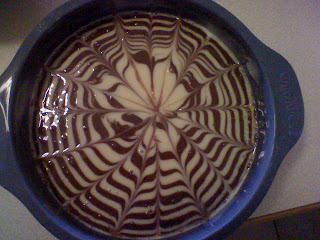 As you could see in the picture above, on many occasions, this is the only time I fail to get it perfectly symmetrical. It was a little off centre but does not affect the stripes inside. You can leave the pattern as it is or run a skewer on the top surface of the cake only to get a more complex looking pattern. This is a good recipe all in all. I got the recipe here, by Farida. I didn't follow the layering techniques though. I started off with 3 tbsp batter on each colour, reducing to 2 tbsp batter each when you're only left with half batter. Finally reduce to 1 tbsp batter each when you have very little left towards the ending. Jo's Deli prefer to start and end the batter with plain batter instead of cocoa but I think it really doesn't matter. Good luck in layering. Practice makes perfect! Remember I said I was trying to clear up leftovers? Avocado is ripening too fast than I could use them. I've adapted them into this healthy milkshake with my stick blender. Did I mention my previous Kenwood didn't make it and have had me returned it twice. I'm currently on Philip and it's working so fine! 1 small hass avocado, flesh only of course! Pop all that into a drinking beaker and run stick blender through it until well combined. 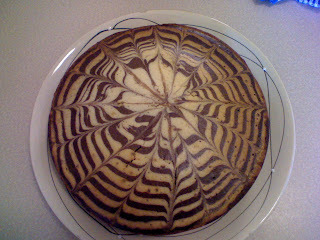 Another cheesecake yet again people....I have been rather busy. Rather busy doing nothing for my 2months holiday. Not to say nothing really, I've been visiting the Morialta Fall and practising my bicycle riding skills. Probably will be riding along the beach this weekend and hike up Morialta Fall again. 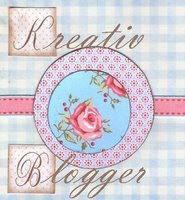 Since I just receive an award for being a Kreativ Blogger, here is something for you guys. No your usual cheesecake. A London cheesecake with avocado in it. Sounds rather interesting to you I hope. Just in case any of you don't know (don't call me show-off! ), London cheesecake consist of a layer of puff pastry, a layer of frangipane mixture on top. Rest that a little while and pop it into the oven to bake till set. Upon cooling, spread it with plain frosting on top and sprinkle on dessicated coconuts. What you see in my picture does not consist whatsoever that I've just mentioned, hence 'Not-Quite-London'. Nigella Lawson's book, 'How To Be A Domestic Goddess' has an awesome London Cheesecake which comes with a sour cream topping (WHAT? YOU'VE YET TO TRY IT? WHERE HAVE YOU BEEN ALL THESE WHILE?). Recipe is available on her website here (CLICK!!!). I've opted for a chewy sorta base rather than graham cracker base. I'm really getting sick of cheesecakes with graham cracker. Half the time I remove the graham base and only eat the cheese filling. I'll probably make a 'no-crust cheesecake' when I shed some weight. Won't be long, have faith in me! Anyway, this recipe is so special because it uses avocado and it's baked! Did I mention I'm also sorta getting sick of no-bake cheesecakes. Those that you just pop them into the fridge and wait. They are often full of fats due to the high content of whipping cream and it has a rather wobbly texture like pudding due to the gelatine. I want something firmer, something creamy, not filling to the palate. I used to think both baked and no-bake cheesecakes are alright to me (see here). Alright, I'll eat my words, happy? This is a self-invented recipe. Only the base is adapted from Baking Bites and I wanna let you people know this is a totally awesome base. I love it so much that I am never gonna use graham cracker base again. Note that I've chose to use lime juice because it's slightly green in colour and I want all-natural colouring in this. You can chose to use lemon juice or don't use any will do too! I do not assure your avocado colour won't turn greyish. I used lime juice in mine and they've remained green for 4 days, a little dull on the 6th days but still not grey, if you know what I mean. Preheat oven to 175°C and grease a 8'' round springform tin. Wrap a layer of cling film around the bottom of the pan where water might seeps in. Wrap again with 2 layers of aluminium foil as insurance. Cream together the butter and sugar until smooth and fluffy. Sift together the remaining ingredients. Mix it well and add to the butter mixture. Use fingers and mix until crumbly and thorough. Press the mixture into prepared tin. Bake it in a preheated oven for 15 mins or until done at 175°C. While baking the crust, weigh your cheese filling ingredients. Let's just be flexible here. The only reason I made this was because I was trying to clear up my leftovers in fridge, which includes avocado, barely any whipping cream in a huge jar eating up my refrigerator space, not-a-full-block of cream cheese and half a lime, cling wrapped for ages. Anyways, just pop everything into a food processor and pulse until well combined. A blender works really well too if you don't have a processor. Don't have a blender too? Well, I'm sorry you'll have to do it step-by-step. I don't really have a step-by-step. Try this, beat together cream cheese, sugar, whipping cream and avocado flesh until combined and crack in egg one at a time. Add in the rest of the remaining ingredients and use a whisk, or a hand held mixer or your hand or whatever tools that best suit you and beat until one beautiful uniform batter forms. Don't worry, it's cream cheese, it will never curdle no matter what. Pour the batter onto the hot crust and hot pan and place the tin on a larger roasting pan. Pour hot water into roasting pan (we're baking this the water bath style!) until halfway up the round tin. Bake at the same temperature for 30mins or so. Do the wobble-jiggle test if you need to. Pour the sugar and vanilla into your sour cream tub and whisk them until smooth and lump-free. Set aside for later use and start cleaning up your utensils. For me, it was just a food processor bowl and a 1 tbsp measuring spoon and a knife used to cut avocado! When the time is up, remove the cheesecake from the oven and cool it a little. I'm afraid the sour cream might curdle if it's too hot since I just took mine out from the refrigerator. When it has cooled down a little, say 10mins or so, pour all the topping onto the cake, spread it around a little to cover crevices and gaps and pop it back into the oven. Bake a further 5 to 10mins and off the oven. Remove from water bath and cool it down until room temperature. Be patient, pop it into the fridge and let it chill overnight. Serve well-chilled the next day. I have comments that the combination (cocoa base+avocado-lime+sour cream) tasted like salted duck egg yolk, banana and etc.